Either I”m getting old or “youngsters these days have a harder time sitting still!” I really think it’s a combination of both, but regardless of that, what are we going to do about it? I’ve found yoga to be a great outlet for me in my personal life as far as my concentration, mindfulness, and overall health, so it makes sense that yoga could be good for my young students too. This post contains affiliate links. If you click through and make a purchase, I may get a small commission at no charge to you. All opinions are my own. 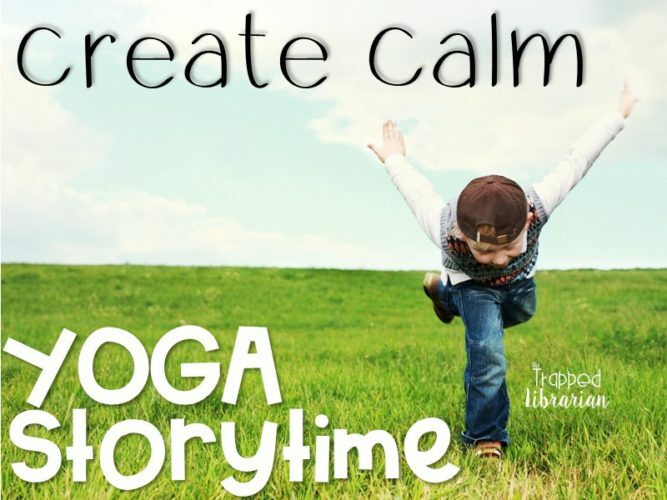 In my quest for strategies to help my littlest learners develop mind and body awareness and get some wiggles out, I’ve found Yoga Storytime to be a wonderful way to actively engage my kindergarten and first grade students in a positive and calm manner. The kiddos love the challenge of learning a pose and trying to hold it. They will breathe in and breathe out with me. They feel a sense of accomplishment and a sense of control. All of this makes the times for sitting still and listening a lot easier. 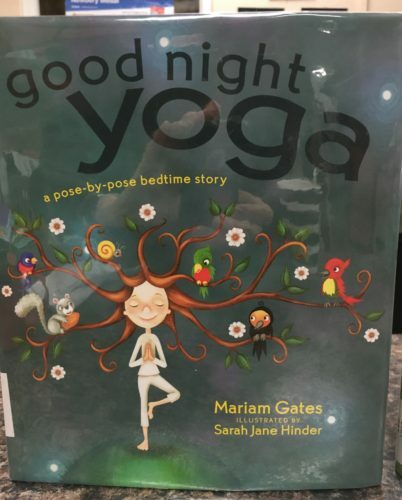 After we have Yoga Storytime once, we can begin every future storytime with a pose or two and that sets the stage for a calm experience for all of us! Why teach yoga to young students? Over the last few years we’ve seen an escalating academic demand on our youngest learners. Starting in kindergarten, and even in pre-kindergarten programs, we are going beyond the traditional role of socialization in our early learning programs to teaching not just pre-reading skills and basic number sense, but reading sight words, fluency, and math computation. And we are often expecting these little ones to sit still, hurry up, and accomplish tasks proving their mastery of these skills. Many of our students who feel a loss of control in life outside of school are struggling to find some control at school and that often leads to “acting out” behaviors. Yoga offers these young kids a chance to practice controlling their bodies and minds in fun and challenging ways. The physical benefits of increased flexibility, strength, and coordination help enhance body awareness. These benefits often lead to better concentration and a sense of calmness and relaxation. I think it helps my students become ready to learn. 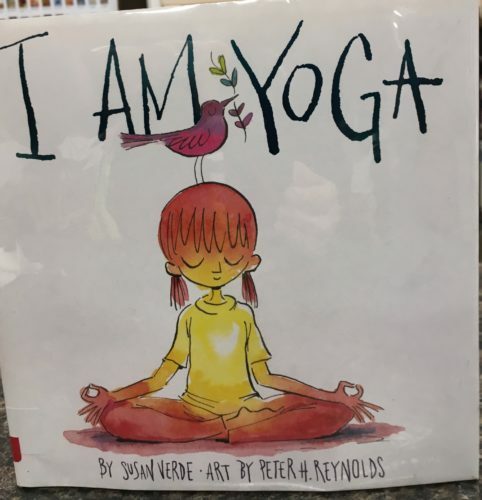 When I went looking for resources for my school library, I found some wonderful yoga books for kids to add to our collection. Following are four titles that I’ve added to our elementary school library and they have been great read-alouds for our storytimes. This beautifully illustrated, uplifting book encourages positive self-talk, visualization, and self control. On each page, the girl is in a yoga pose and the illustration shows what she is visualizing. Positive statements such as “I can soar among the clouds. I am so free.” accompany the peaceful pictures in a variety of environments. The author’s note in the back contains detailed explanations for each pose. 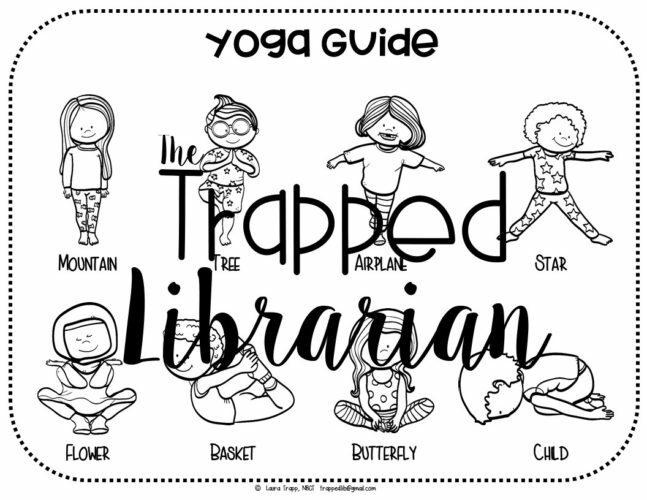 This section is ideal for a teacher who is leading students in trying some yoga. I highly recommend this book for elementary school libraries and classrooms! Both of these books depict diverse children in various activities in nature, and the reader can see how their actions are like yoga poses. Each two page spread includes a line from the story (“Today I’m a fiery volcano reaching high,”) and an explanation for the pose (“As I breathe in, as I breathe out, I lift up on tiptoes and reach my fingers high.”). The illustrations in both titles are bright, peaceful, and happy. In addition to the guidelines on each page, there is a “flow” at the end with explanations for each pose. After that, a visualization exercise “How I Want to Feel Today” (Good Morning Yoga) and “Cloud Journey Visualization” (Good Night Yoga) are nice ways to end the book. Sweet illustrations and a simple layout will make this book appealing for young listeners during storytime. Each two page spread gives guidance: “Sit on your heels, hands on your knees, tongue out!” This is followed by a visualization of sorts: “You are a… Lion! 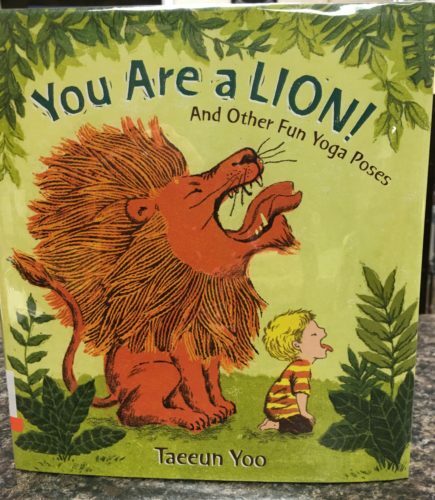 King of the jungle, roaring so loud, make the words rumble.” Although there are no notes about poses or any extra guidance, this book is perfect for yoga storytime too! The illustrations are vibrant and the rhyming text flows nicely in this fun book. Each two-page spread shows young Lyla doing a different pose and getting some fun tips from the animals at the zoo. Young readers and listeners can count the animals on each page too! Lyla’s flow at the end has helpful instructions for each animal-inspired pose. 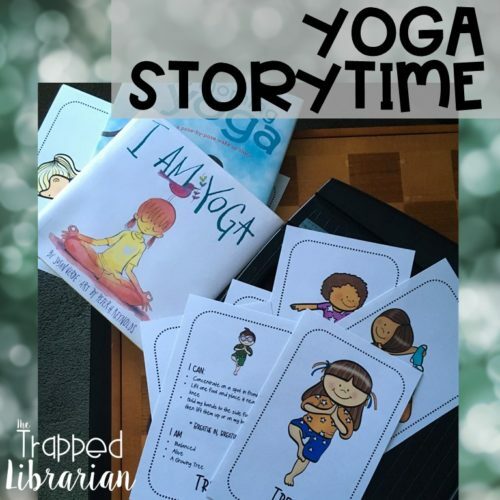 This year I’ve tried Yoga Storytime with my kindergarten and first grade classes. In preparation I practiced at home first and I made sure to wear comfortable clothing so I would be able to move with them! During the weeks that I’m doing this, I keep a bag at school with some yoga pants, a comfy sweatshirt, and soft sneakers just in case I forget and wear a dress or an outfit that doesn’t allow me to move comfortably! I don’t have kids take off their shoes because of the limited time I have them in the library, but you may want to. If you don’t, make sure they spread out when you try the poses so that no one gets kicked in the head! I started off by asking if any of them have tried yoga. I found that many of my students had, or their parents do yoga, and they were very excited about that! I told them that many people like to do yoga because it is challenging and calming and fun. We start off sitting cross-legged with our hands in a comfortable place and take a deep breath in and out. I stood in the back of the group to keep an eye on everyone, and in all of my classes I found that many children were singing along by the end and most of them were trying the poses that were being demonstrated in the video! 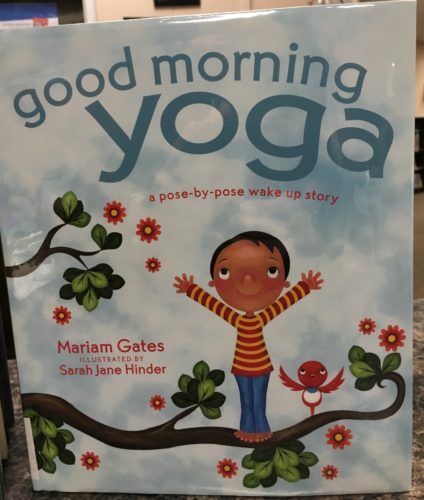 Next we read Good Morning Yoga by Miriam Gates. Afterwards I used some yoga cards that I had made to guide me in leading the students in several of the poses found in both books. We all loved the challenge and I found that the silliness was kept to a minimum because everyone was concentrating on holding their poses. Each time we tried a new pose, I was sure to use a calm voice and ask the students to breathe in and breathe out with me. I read an affirmation to them while they were holding the pose (“I am sparkly, twinkly, a shining star!”) We ended our session in child pose to encourage a sense of calm and relaxation. 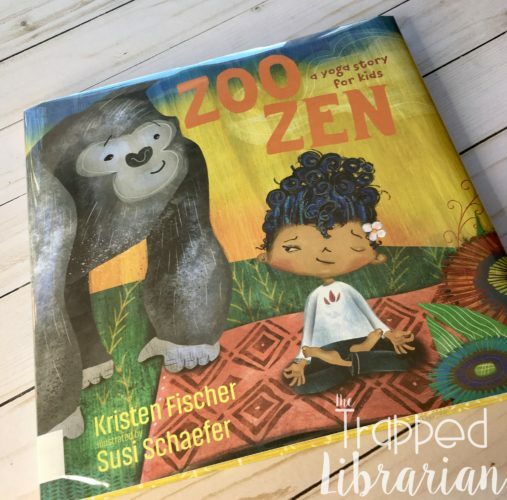 Now when I have my kindergarten and first grade classes, we start and end our storytime with a couple of students choosing a yoga card from a basket and we spread out and all try the poses together. Then we sit calmly with our legs crossed and listen to the story. 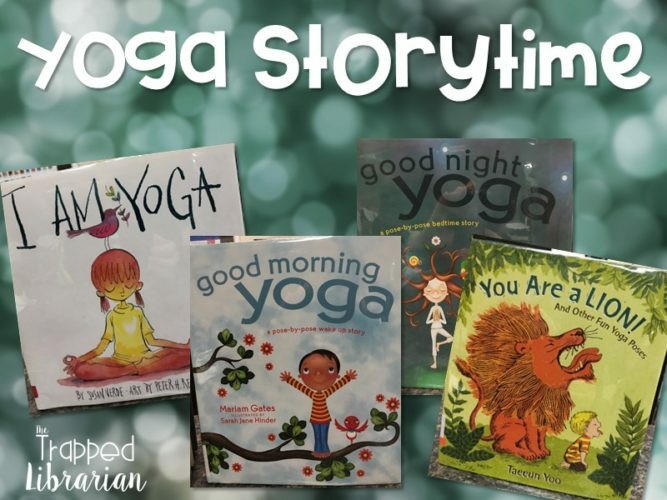 I have noticed a difference in the ability of my students to sit still for the story now that we have built a little bit of yoga into our routine! To thank you for visiting, I’d like to share a FREE Yoga Pose Guide, which is included in my Yoga Storytime resource! Just click the image below to access it! Do you do yoga with your students? I’d love to hear about your experiences – please leave a comment below! If you haven’t, I encourage you to give it a try! 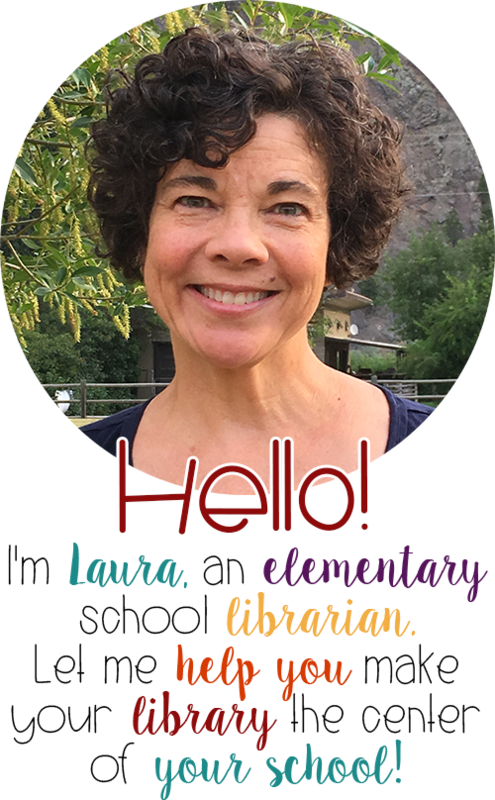 I bet you and your students will love it!